One of the most important recent updates to the RESNET Mortgage Industry National Home Energy Rating Standards was to include additional appliance features within the HERS Index calculation, such as clothes washers, dryers and advanced cooking features. Due to these changes, REM/Rate has also been updated to accommodate these new appliance efficiency options. These changes have caused confusion as to how to find and properly enter in this new data into the software, and has led to some pretty wacky results. To help clear up this confusion, a thorough review of these inputs shall be provided here, along with how to find and correctly model the relevant efficiency data. The question was always asked, why doesn’t the software consider other appliances, such as clothes washers, TVs, pool heaters, etc.? The answer is that in order for an energy feature to be included in the HERS Index calculation, there has to be a reference efficiency standard for such features. The RESNET Techincal Committee is responsible for developing these standards and implementing them into the RESNET Chapter 3 Home Energy Rating Technical Standards. Although we might not yet have the opportunity to model pools and spas, according to RESNET we probably will oneday. 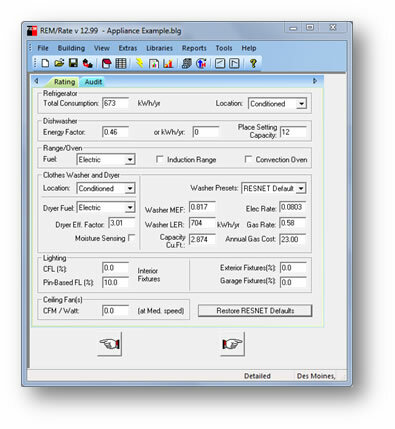 In the meantime, we have the opportunity to work with the myriad of new appliance inputs now included in REM/Rate. After debuting these new inputs in Version 12.97, the software manufacturers appear to have out the kinks in the calculations so as to ensure consistent report generation. For a better understanding of these new inputs and how to find the correct data, lets explore each feature.